We love Mexican food. 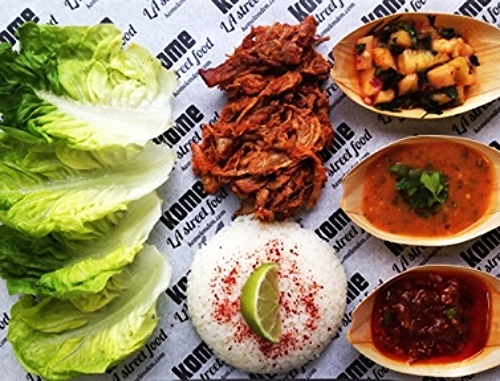 And we love Korean food, so hearts should be swelling with Kore-Mexi love as Kome LA Street Food start a weekly weekend residency in the Dead Dolls Club from today. That means treats like kimchi quesadillas, bulgogi fries or ssams (Korean-style lettuce wraps) with BBQ chicken or pan-fried aubergine to liven up your tastebuds of a Friday night. Dishes cost around £8 each and the kitchen serves from 5pm until midnight. Is it 5pm yet? Unfortunately, some people don't think it's the 'done thing" to have a liquid lunch. Or liquid dinner. But, as it's London Cocktail Week, the ingenious White Room Supper Club have come up with a one-off dinner where you can eat your cocktails. Which, when you look at the menu, actually sounds pretty tasty. On the menu (alongside a welcome lychee martini) is gin-cured salmon and cucumber, Bloody Mary soup, Pina Colada fish curry, Mojito poussin and finishing with strawberry cheesecake with a strawberry daiquiri sorbet. A real plate-licker of a menu. Tickets cost £35 from here, and it starts at 7.30pm in Islington. Is your soul in need of a bit of a squeeze? Is your mouth in need of some Caribbean-inspired food? Well, the two things are joyously coming together for one night at the Ace Hotel Shoreditch with the Supa Dupa Fly vs. Soul Food night. Chef Joseph Curtis will be cooking up a homely three-course meal of pulled jerk chicken and cornbread, curried lamb with coconut rice and plantains and finishing with bluerberry pie and vanilla cream. Soundtracking the night will be a live set from Leonn and DJs Shortee Blitz and Emily Rawson. Tickets cost £35 from here. The feasting starts at 7pm, but the party goes on until 3am. Now that's how you do Saturday night. The Town Hall in Bethnal Green is going all legal on Sunday and turning into a courtroom for a film-and-food screening of the old classic, 12 Angry Men. Hosted by immersive cinema crew Press Play, the £30 ticket includes a seat "on the jury" (watching the film) as well as a complimentary cocktail and an American bento box of pulled pork bun, buffalo wings, chilli nachos and coleslaw. Bonus - it's not your death row dinner. Get tickets and more details from here. Doors open at 7pm.